Remember, Rinda will enjoy this book and then pass it on, so be sure to check out Gallo Organico where she blogs and shares her own art journal pages & other creative endeavours. After creating a layout yesterday about my oldest niece's birthday party in 2007, I pulled out another set of 2007 birthday photos to use with Sketch Support's One-Page Sketch #13. This layout highlights photos from Pun'kin's 10th Birthday party. Once again I used a piece of the party invitation as my title block. 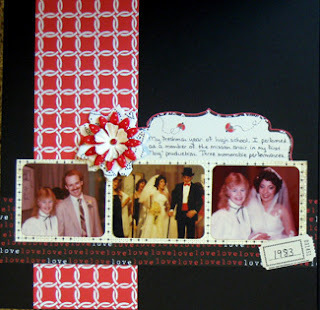 This was a quick fun layout to put together using one piece of cardstock and then bits & pieces from my scraps. For embellishments I simply added a "celebrate" sticker over the corner of the bottom left photo to highlight one of the photos of my niece and two strips of a quote sticker underlined with ric rac. I love the simplicity of this layout and the fact that I was able to use 10 photos. 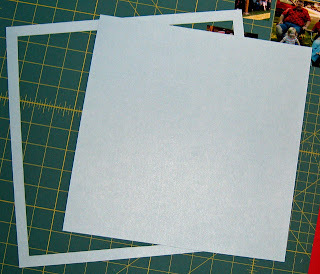 What about you - do you save the middles of your papers? 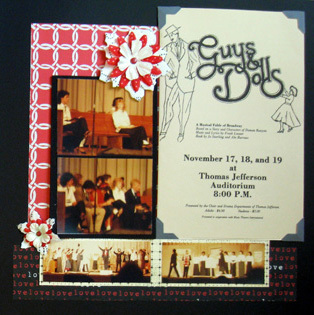 Yes, I really was in a production of Guys & Dolls! I saved a few of these horrible photos for a future layout about this past summer when Robbie and I went to see a professional theatre production of this same musical. I want to create a connections layout about my high school production, the production we saw this summer, and Robbie's high school production where he worked on the stage crew. It might be a little while before that one all comes together, but it's on my layout ideas list. Anyone else scrap some really old photos lately? Did you find it hard to work with them? 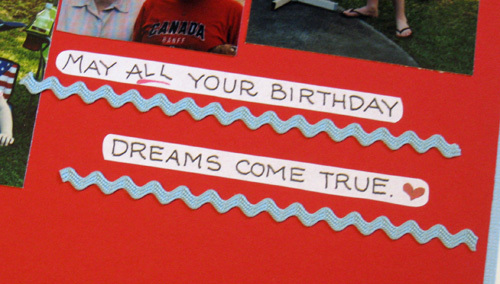 I'm so excited that I've had time to create a two-page layout two days in a row. There's only one more day of the LOAD portion of The Mother LOAD workshop - tomorrow is the 26th day. So far I've created at least one layout on 15 days, with a total of 18 layouts. Both of the layouts I'm sharing today are based on sketches from the Double Take workshop. 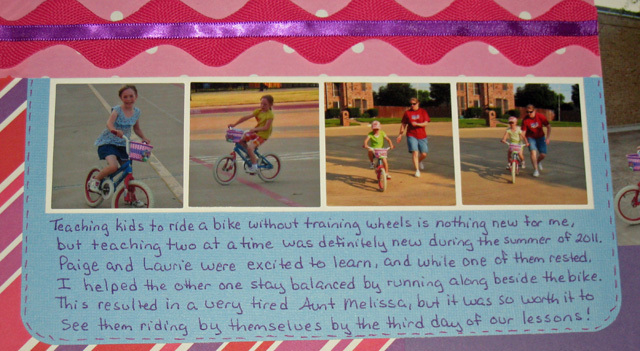 This first one highlights my time teaching the twins to ride their bikes without training wheels this past summer, so it also counts for this week's Library of Memories Community weekly challenge to create a summer layout. 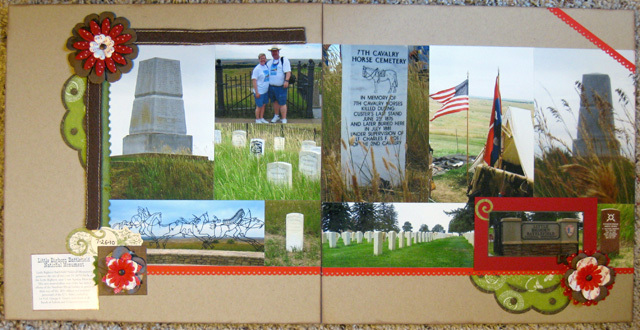 The next layout showcases some of my favorite photos from our stop at Little Bighorn Battlefield last summer during our Banff Road Trip. The sketch actually called for five 4x6 portrait photos, but I had so many photos that I modified the sketch to include another row of photos below those. 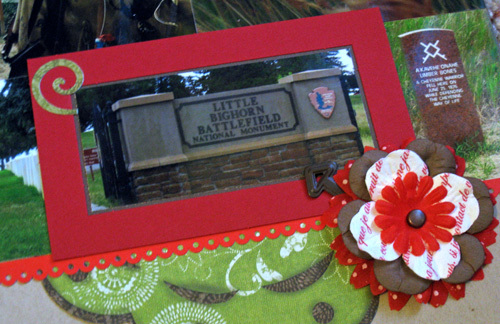 Instead of creating a title, I highlighted the photo of the entrance to the battlefield. And I included a piece of memorabilia in my embellishment cluster that tells a little of the history of the battlefield. I'm really enjoying the sketches in this workshop! 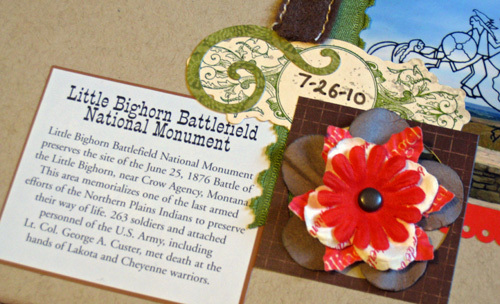 (There's still time to register for the workshop - click here for more information.) 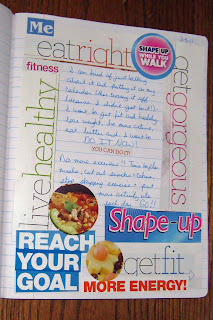 My sister, Brenda, is also taking the workshop and I'm enjoying seeing her layouts with the same sketches. You can see a couple of them on her blog here. 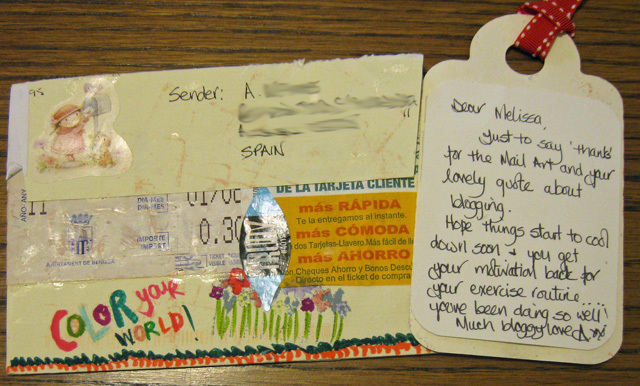 On another note, I received TWO pieces of happy mail this week. 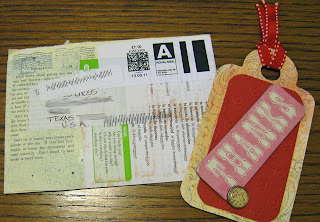 The first one came from Danielle of EcoScrapbook and was part of Ginger's September Mail Art Exchange. 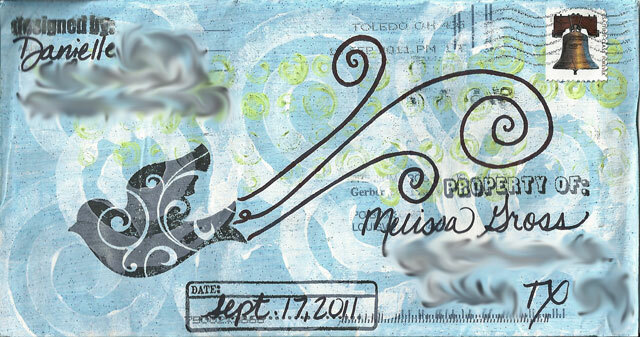 I really like the color of this envelope with the subtle swirls and the papers she used on the enclosed card. 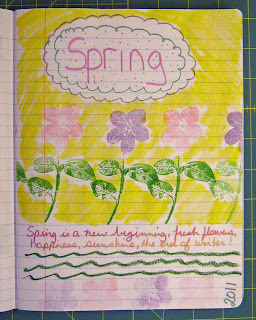 I have to admit that until this past week I have not truly delved into art journaling. 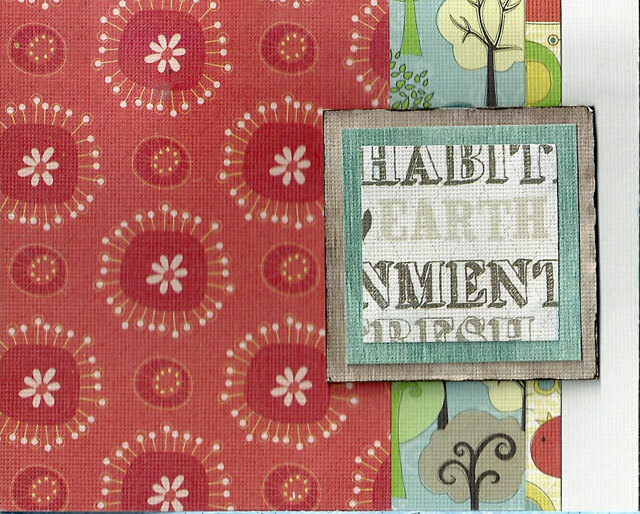 Last November, I chose a composition book to use as an art journal, added some printed cover art from Jessica Sprague, and created a dedication page. 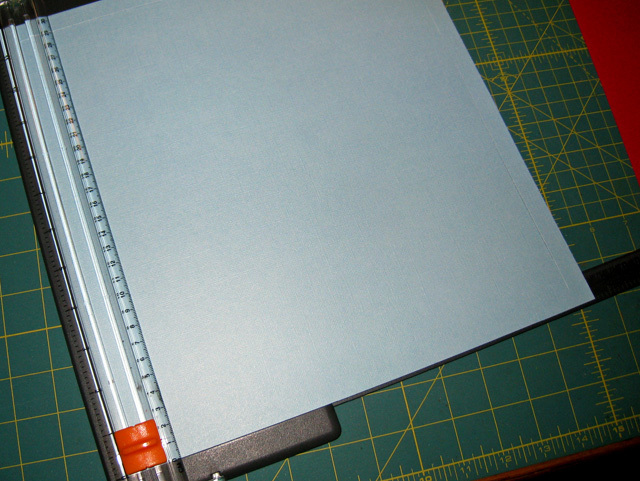 (You can see the journal here.) And then it sat for a while several months before I finally added a few pages to it this past spring. I created a couple of collage style pages and one page with stamping and coloring. Along the way, I also glued in some Mail Art envelopes & cards I've received - an idea I saw on Cheri's blog several months ago. 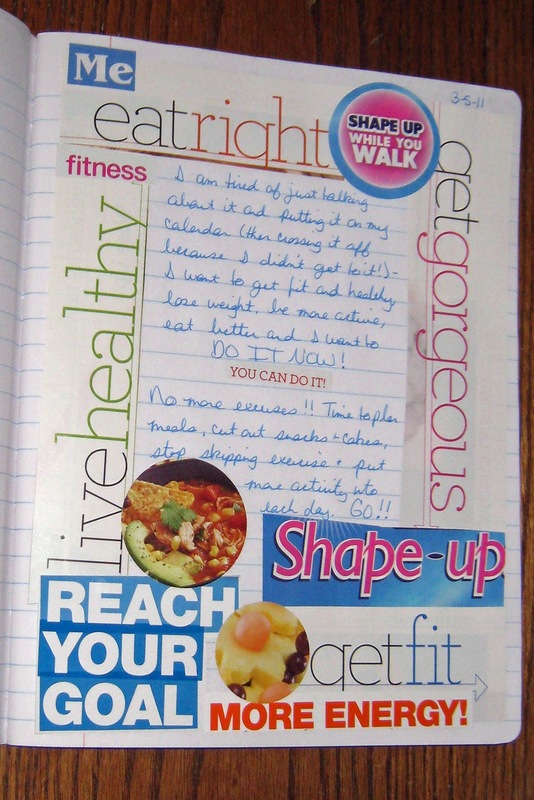 However, this past week I pulled out my Art Journal and create three pages inspired by September's book for Pass the Book:Year Two! Raw Art Journaling by Quinn McDonald contains numerous ideas for art journal pages as well as step-by-step instructions. 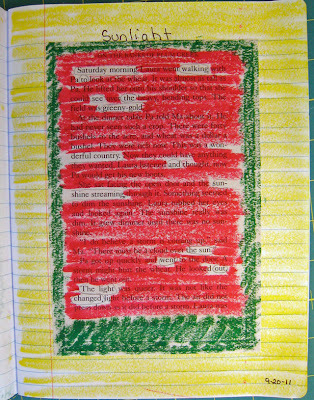 One idea that really caught my attention was "Found Poetry." 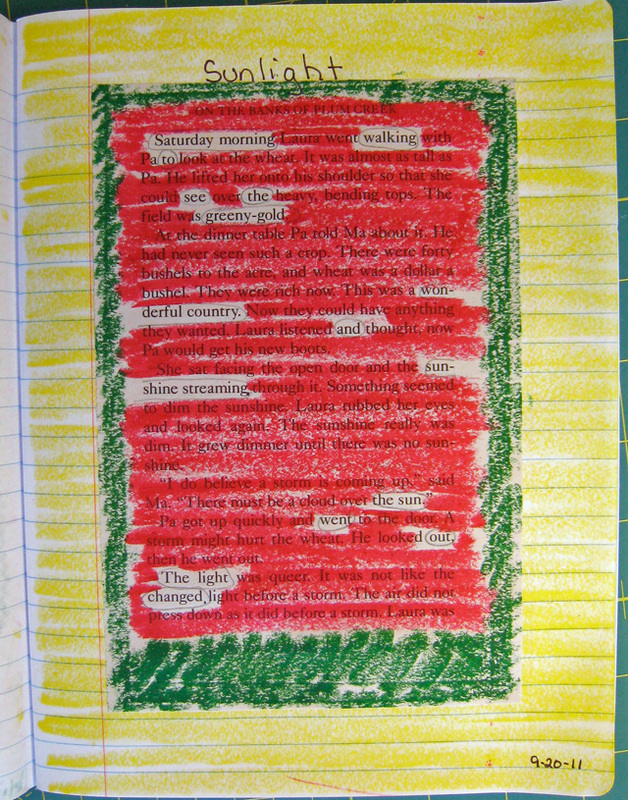 The book discussed two types of "found poetry" - one created from cutting words from one page of a magazine and one created from words on the page of a book. 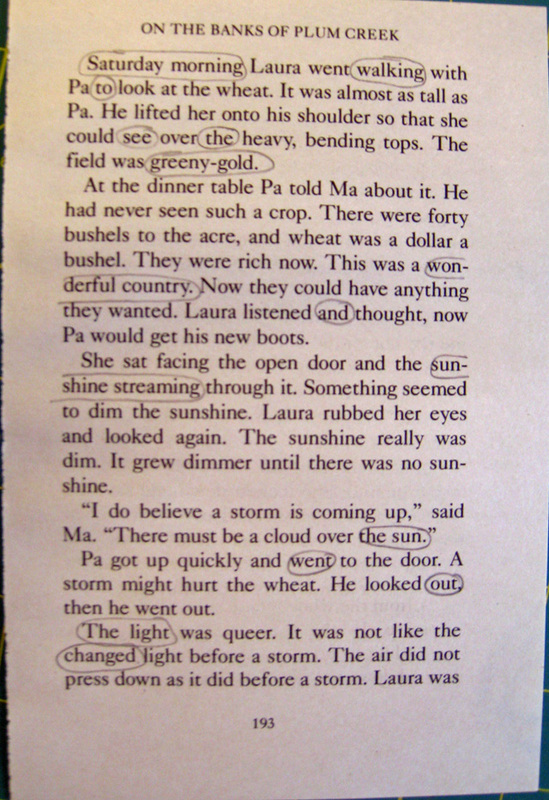 For the first one, I pulled a page out of an old TV magazine (from the 1960s) and clipped words that seemed to go together. 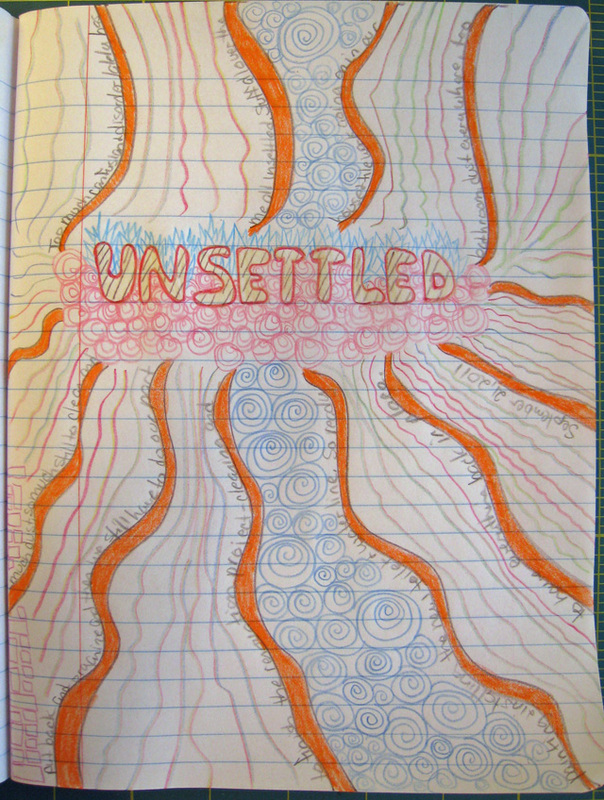 I adhered them to my page, then doddled around the "poem" as I tried out several of the markers in my stash to see if they were still good. 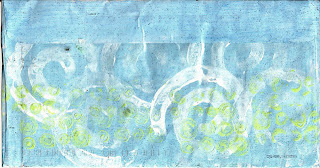 As you can tell from the faded lines, many of these markers then ended up in the trash. 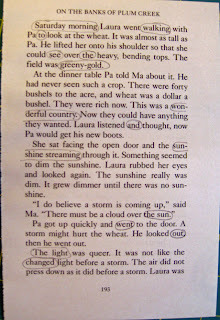 Next, I pulled a page from a Little House on the Prairie book and circled words to create an original "poem." 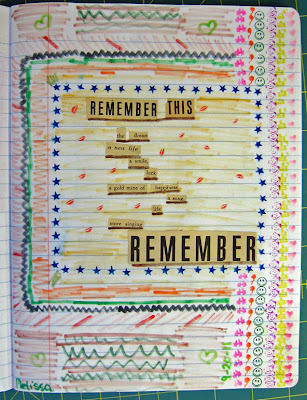 I then colored over the remaining words using a Crayola Slick Stix. (Every year at Christmas Robbie buys me the latest and greatest Crayola product!) 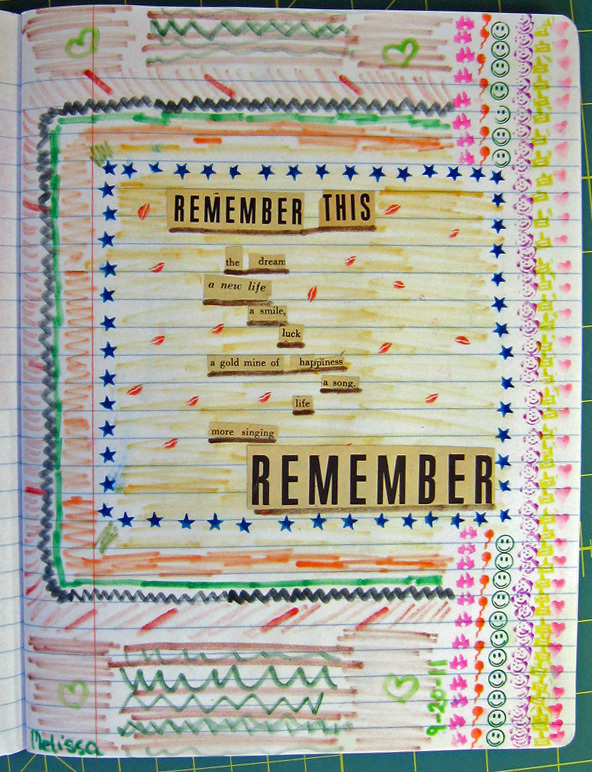 I adhered the page in my Art Journal and filled in rest of the page with Slick Stixs. Saturday morning walking to see the greeny-gold wonderful country and sunshine streaming. the sun went out, the light changed. There were also examples of drawing words and lines and frames, so I tried my hand at a page simply using colored pencils. 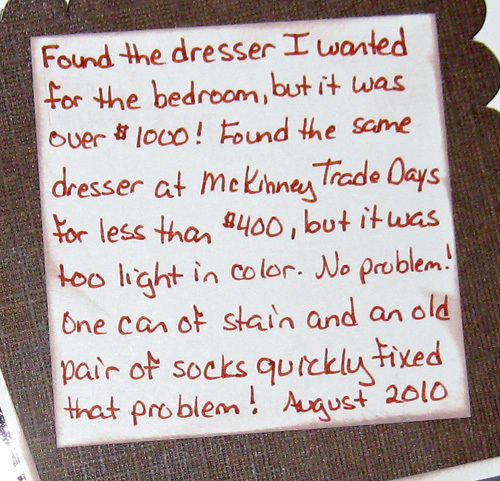 This page reflects how I've been feeling with the bathroom renovation and everything from the bathroom & closet scattered throughout the house! 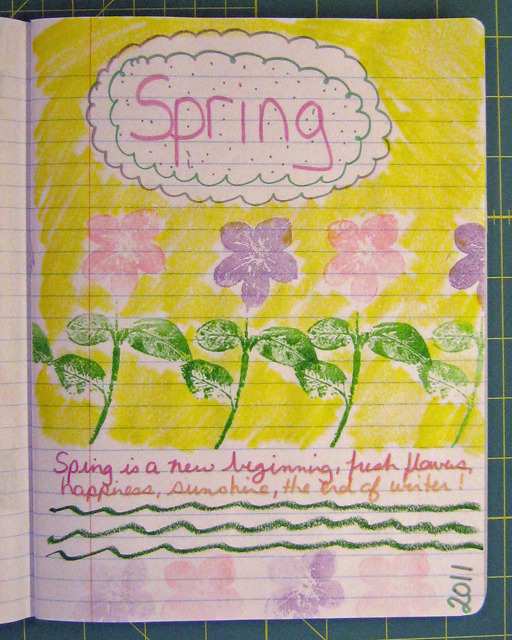 I may not win any awards for the best or most creative Art Journal pages, but I must admit that I enjoyed trying out some new ideas. 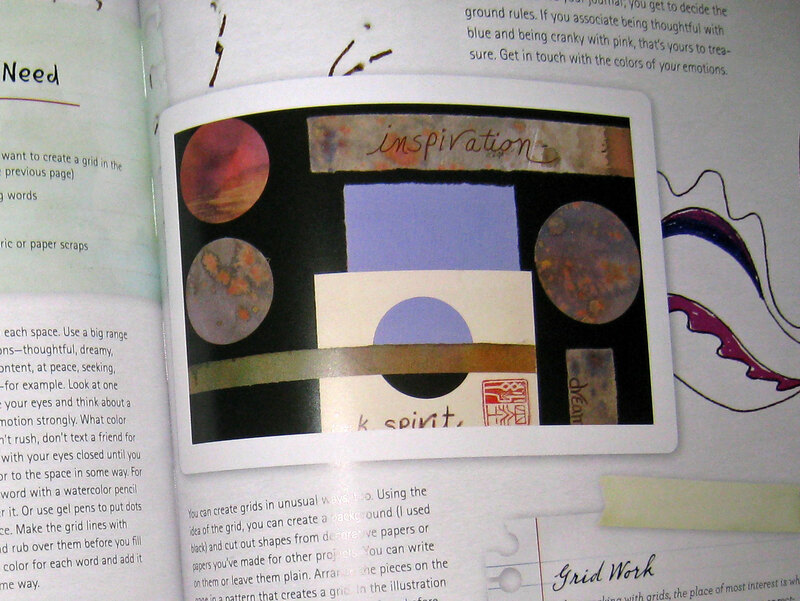 These few pages were inspired by just a handful of the many ideas for art journal pages presented in this interesting book, which I am ready to pass on for one of you to enjoy and find inspiration from. You can learn all about how Pass the Book: Year Two works by clicking here. 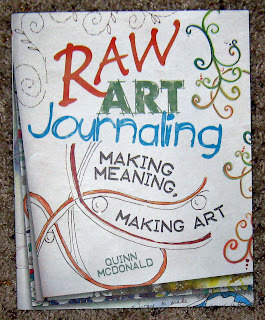 If you'd like a chance to be the first recipient of Raw Art Journaling by Quinn McDonald, please leave a comment telling me whether or not you have an Art Journal (or two or three) and how long you've been creating Art Journal pages. I'll pick a name and announce the first recipient of this book next Thursday. I am so excited about the BPC Double Take workshop that began yesterday. This workshop is being taught by May Flaum AND Nic Howard. 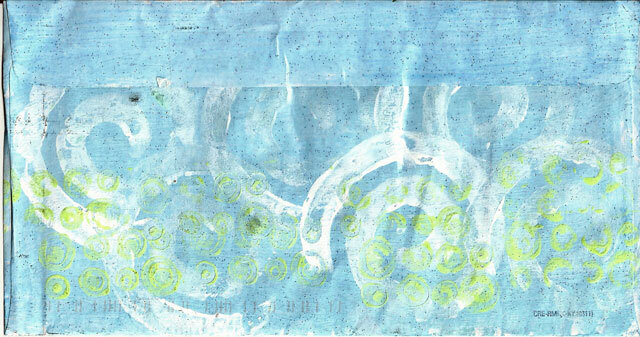 We get four double-page sketches each week and a sample layout for each from both May & Nic. I used this week's Sketch 2 for my LOAD Day 22 layout. The contractors will be done with their part of our bathroom renovation today, and Robbie and I will be putting some finishing touches on it, cleaning and putting everything back in place this weekend. We also have three banquets to attend! However, I'm hopeful that I'll be able to squeeze in another layout or two also. It's Day 19 of The Mother LOAD, and so far I have created 16 layouts. 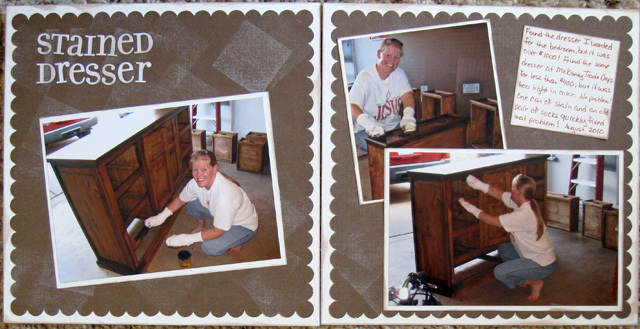 Today's layout is another quick two-page layout for my DIY mini-album - this one highlighting the dresser we purchased for our bedroom that was much too light to match the other furniture. 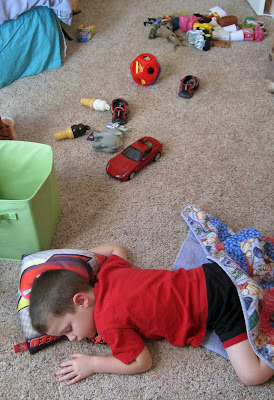 I'm several days behind on reading the LOAD and LSNED prompts, and I wasn't sure if I would be able to create any layouts for a few more days because we have a really cute 3-year-old house guest. However, I discovered that occassionally he will simply play himself right into a nap, leaving just enough time to process some email and create a layout! I spent most of today cleaning our bedroom - dusting, vacuuming, moving furniture so I could clean the dust behind and underneath it, wiping down walls and furniture, etc. I'm pretty exhausted this evening, so I decided to scraplift myself and duplicate a layout I'd previously created. I had planned to create a similar layout for my albums and had these same photos printed and in my 2009 storage binder. I had printed the larger sized photo for my original layout, but decided to use the 4x6s I had on hand to create a layout today. 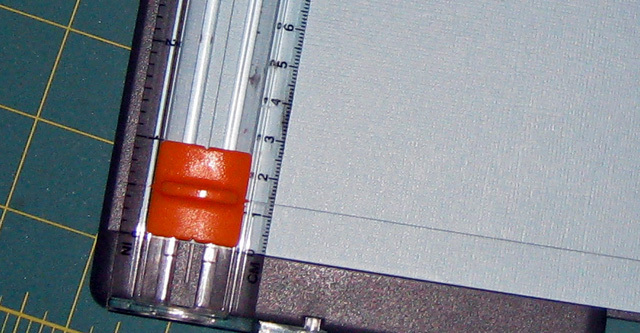 I also used letter stickers instead of cutting the title on my Cricut, simply for convenience as I'm planning to head to bed early. 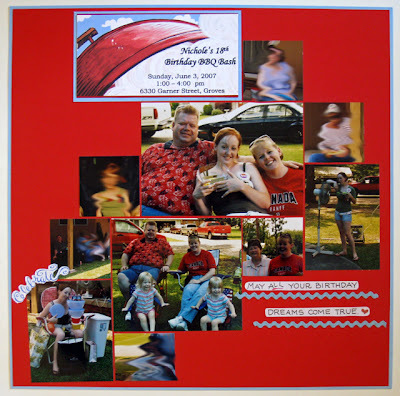 I'm glad to finally complete this layout for my Family & Friends LOM album. 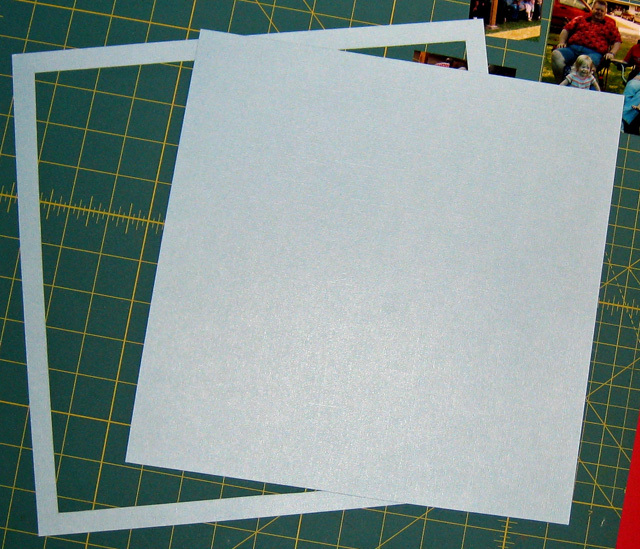 This is only the second time I've made duplicate (or near duplicate) layouts. I'm not sure which one I like the best - what do you think? 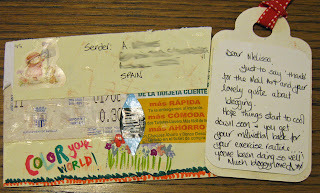 Later another package arrived, this one from my sister. 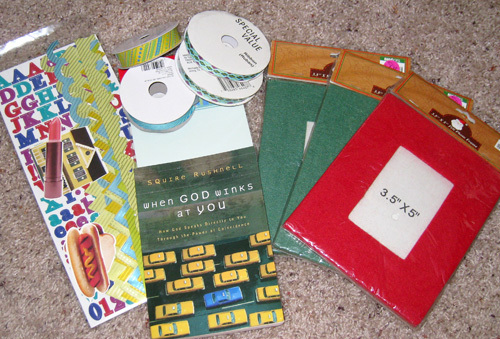 A couple of months ago, she had borrowed a book from me and was returning it along with some craft kits she had that she thought the children's department at our church would enjoy. 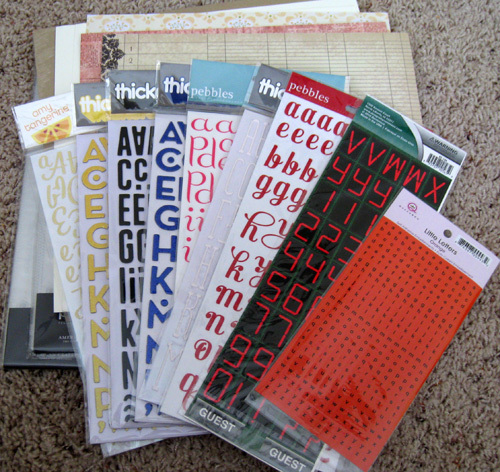 And since she was sending a box my way, she decided to include some extra goodies - letter stickers, borders, die cuts, rolls of ribbon, a book for me to read, and some cute photo frames to decorate! Thanks Brenda! I also enjoyed a nice visit from a friend who stopped by to deliver some Mary Kay products I'd ordered last week - the Satin Hands kit. I enjoyed the visit and now I can give my hands some pampering after all that cleaning today. 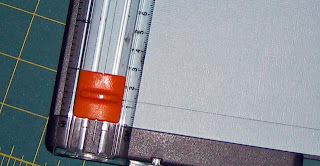 Today's LOAD prompt encouraged us to stamp on our layouts. I chose this sketch from Elle's Studio Sketch Thursday series as the inspiration for my layout. 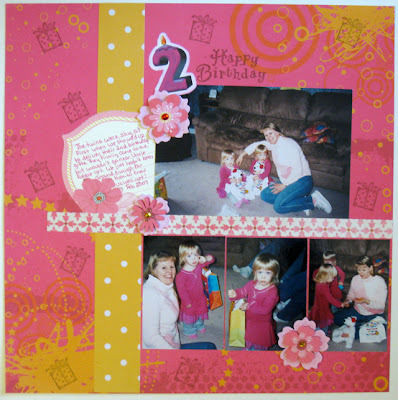 I started with a really fun pink & yellow background paper, so this layout went together very quickly. 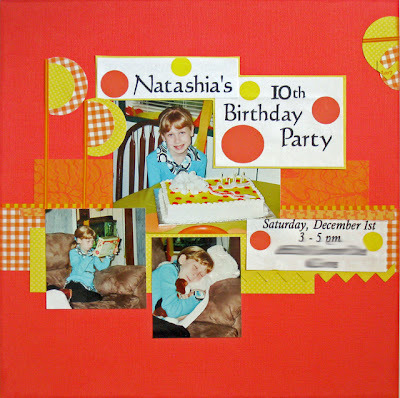 I used a Happy Birthday stamp for the title and a gift box stamp randomly to add to the fun of the background paper. 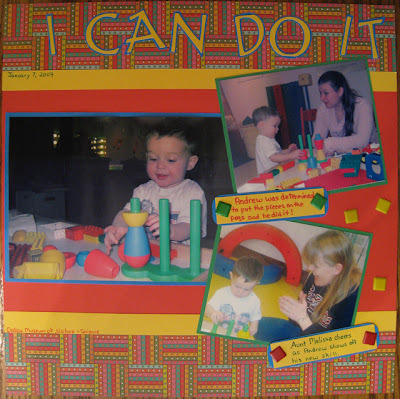 It's amazing to me that my twin nieces are already six and a half years old and I'm just now scrapping the photos of their 2nd birthday gifts! 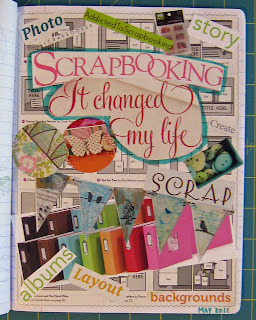 Of course, that's why I enjoy scrapbooking non-chronologically - no one really knows if I'm "caught up" or "behind" because I just scrap whatever inspires me on any particular day. 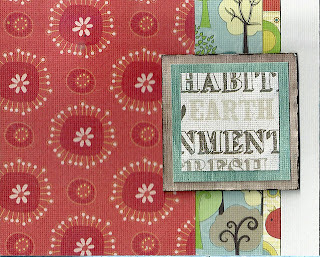 One of this week's prompts in the LSNED class encouraged us to watch for those lessons that we learn the hard way. This week I've learned that if the old tile mortar won't come off the bathroom floor easily and the contractor decides to grind and sand it off, it's best to have everything (EVERYTHING!) covered in plastic. 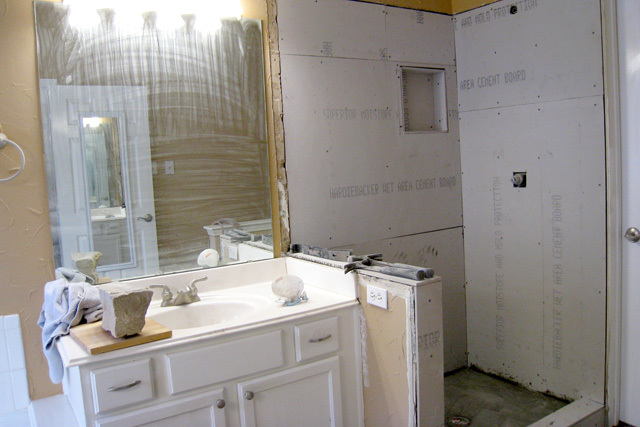 If not, your bathroom will look like this . . .
and if by chance they also don't put anything to block the dust, the bedroom might also collect enough dust to fill a pot hole! That's the basic lesson . . . but the other lesson is that it is OK on days like that to sit down and have a cold Coca-Cola (even if you've already had your one for the day!) 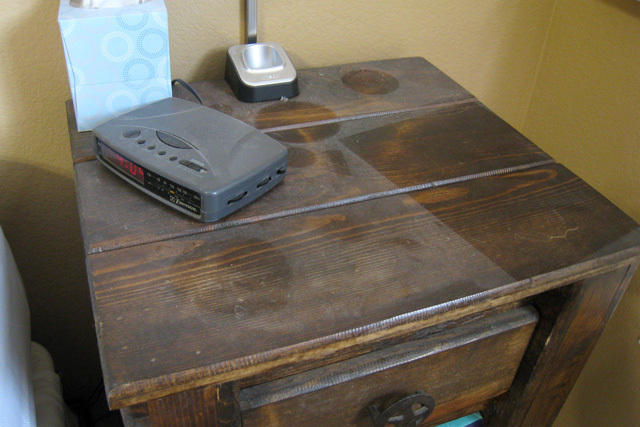 and remind yourself that truly it is just dust and it can be cleaned!! It will take a lot of cleaning (and a few more Coca-Colas), but in the whole scheme of things it's just dust! Saturday's LOAD prompt was to pull another one of the embellishment baggies we put together at the beginning of the workshop and use them on a layout with a black & white photo. 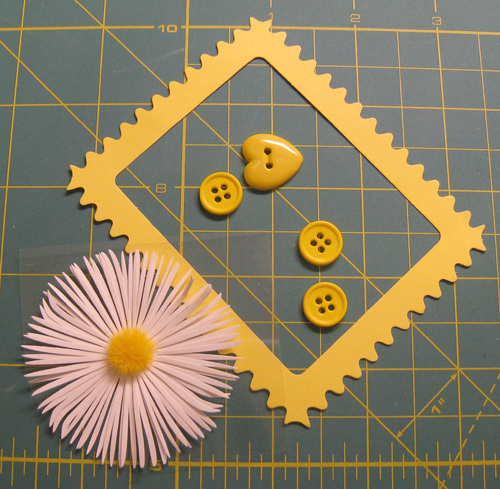 I pulled the baggie with these cute yellow & white items to start a simple layout today. 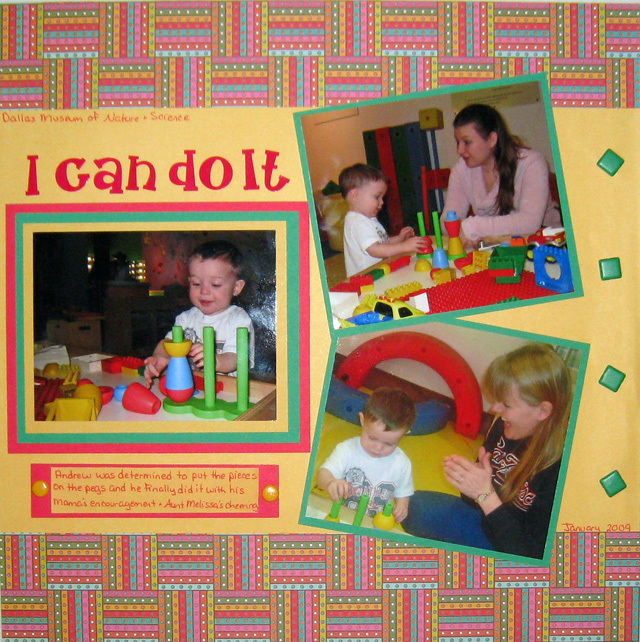 I actually used the sketch that Lain provided with today's prompt for this simple layout highlighting a photo of me at one-year-old. 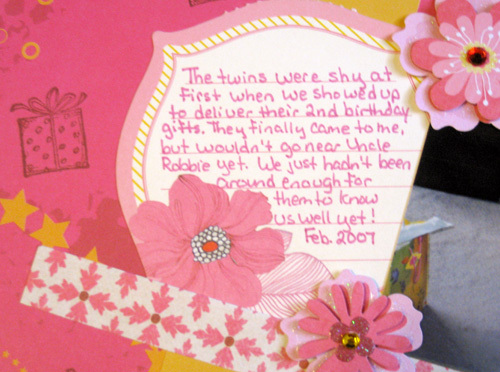 I ended up not using the yellow frame because I wanted to preserve the size of this older photo with my Mama's handwriting across the top of it. I considered working on a patriotic layout today and writing the story of what I was doing 10 years ago when I heard about the terrorist attacks, but that story is really also tied into when I met Robbie (4 days before 9-11-01) and the fact that his boss had changed their plans to fly to New York (their original tickets were for the 11th, but were changed to the 12th on the 10th) and how we attended the most wonderful patriotic church service the following Sunday.... etc. So, I've decided to save that layout and those stories for a time when I'm inspired to put it all together in a mini-album and for today I'll just say, "I'm proud to be an American!" I realized recently that I've read quite a few books over the past couple of months that I have not reviewed, so I thought I'd share a review of ten of those books with you today. I hope you'll find a book or two to add to your reading list (and you might find one or two to avoid!). First, I'd read about Brene Brown's books on several blogs, and checked out The Gifts of Imperfection from our local library. 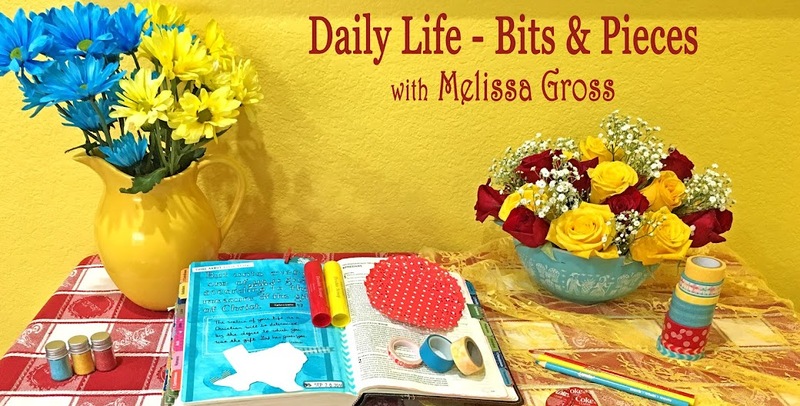 The book is about living a wholehearted life and focuses on three ingredients of living wholeheartedly: courage, compassion, connection. I enjoyed the book and her honest assessment of how she had not been incorporating many of the guideposts of wholehearted living into her own life before the research that lead to this book. One of my favorite guideposts was #7 - Cultivating Play and Rest in our lives by "letting go of exhaustion as a status symbol and productivity as self-worth." I also agree with her assessment that "there's no such thing as creative people and non-creative people. There are only people who use their creativity and people who don't." Robbie and I had recently watched the movie Paper Moon and saw that it was based on the book by Joe David Brown, so we picked up a copy & both read it. It's the story of a young girl traveling through the south with the man that is probably her father. He is a con man and they spend their time swindling people out of money,then hightailing it to the next town. The movie actually only portrays about half of the book, so there were new behind-the-scenes stories to add to the movie version. I enjoyed the book and movie. This is the book my book club chose for our September meeting: Sarah's Key by Tatiana de Rosnay . It is two stories woven into one: the first is the story of a 10-year-old girl who lived through the Vel d'Hiv' roundup of Jews in France in July of 1942 and how she escaped transportation to Auschwitz; the second story is of a 45-year-old American journalist living in France in 2002 who is assigned a story on the roundups. This is a very well-written book, a page-turner that keeps you wondering what will happen next. While the material about the Nazi's treatment of Jews during World War II was difficult (as always) to read, this book also focused on the French police's part in these roundups. I honestly have never read much about what happened in France during the war, so this was a good book for learning about one more atrocity of the war. (Things we should never forget least they are repeated in future generations.) This is a fiction book, however the historical accuracy of the events during July 1942 were well researched. The Journal of Ben Uchida: Citizen 13559 Mirror Lake Internment Camp is one book in the Dear America series of Junior books. My younger sister gave me several of these books last year, and I pulled this one from my to-read pile recently. I actually read this right after Sarah's Key, although I had not planned to read two World War II books, both revealing inadequate or completely wrong decisions by a country's government. Each chapter in this book is written in the form of a journal entry of a young Japanese boy who was placed with his family in an internment camp in the United States during World War II. I know a little history of this embarrassing time in US history, and have read other fiction accounts of life in these camps. I enjoyed this perspective from that of a young boy, old enough to understand what was going on but still not understanding why it was happening to him and his family. 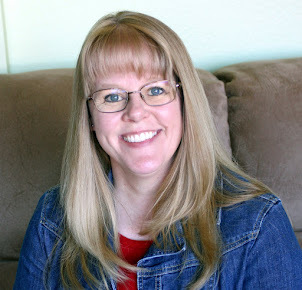 There were times that I thought the writing was a little too thoughtful for that of a pre-teen boy, however I realize that these books are designed to entertain and to inform young readers. There was also a section where the dates were mixed up - out of order and incorrect (if Friday is the 12th, Sunday won't be the 15th! ), but overall it was a good story and historically accurate. I love this sarcastic quote as the young boy discusses how all the buildings looked exactly the same and were not marked within the camp: "They want to see how long it will take the average twelve-year-old kid to go crazy because he has to spend all day running around in circles just to find his way back to where he lives." My Mama loaned me her audio copy of Mike Huckabee's A Simple Christmas: Twelve Stories That Celebrate the True Holiday Spirit earlier this year, and I listened to it off and on in the car while doing errands over a period of several weeks. Each chapter is a story from Mike Huckabee's life (growing up, his wife's bout with cancer early in their marriage, being a pastor, serving as governor of Arkansas, running for president of the United States) focused around the Christmas season during that time in his life. It was an enjoyable and informative book and well-read by Mike Huckabee himself. I picked up Jennifer Grant's Good Stuff: A Reminiscence of My Father, Cary Grant from the new books shelf at our library because Robbie enjoys reading memoirs about various entertainment stars. When he finished the book, I read through it. I honestly felt like this was the book Jennifer Grant needed to write as part of her therapy of coming to grips with her life (or something like that). I honestly didn't enjoy the book as it seemed rather filtered (only sharing the good things) and was filled with name dropping that was unnecessary (in my opinion). I would not recommend this book as a easy or informative read. This is another book I checked out from our local library. It caught my eye while I was browsing the scrapbooking section. What About the Words? 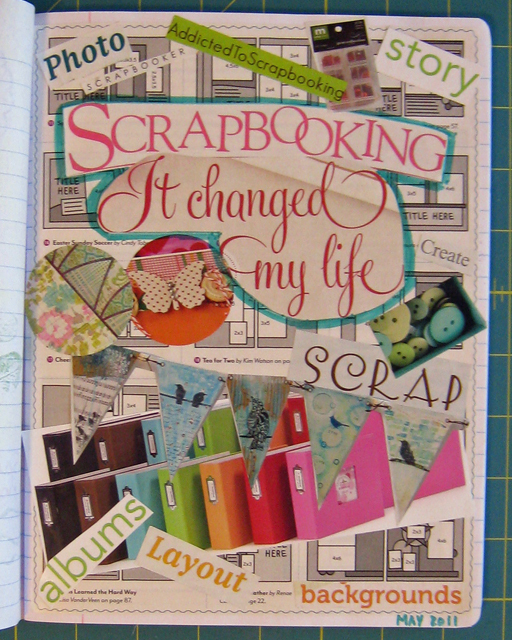 focuses on creative journaling on scrapbook pages. 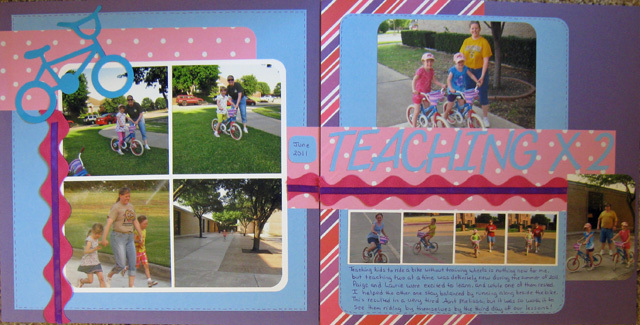 There were lots of inspiring examples of layouts and a variety of journaling ideas. I always enjoy these types of books because they inspire me to create! I've never read a book by A.W. Tozer, who is a well-known Christian pastor, author, and magazine editor, so I picked up We Travel an Appointed Way at the library. The book is one of a series of books containing a collection of Tozer's editorial columns from his time as editor of Alliance Life magazine. While the articles themselves were interesting, I found the writing style difficult to read therefore hard to follow at times. For those of you who've stayed with me through this long post, I want to share my favorite quote from Stained Glass Hearts. This thought from Patsy Clairmont comes near the beginning of her chapter about books and reading. "If it were up to me, I would mandate people wear pages of great books as clothing (copies, of course). Then no one would be boring." She goes on to say that if a conversation becomes boring at least we could "pipe in fresh water by reading a sleeve or two, quoting a collar, or scanning a shoe." If you've read any of these books, please share your opinions in the comments, and I'd love to hear about any great books you've read lately. This post is part of Shimelle's Ten on the Tenth. To see more Ten Things posts, click here.